We have snow here! I feel like it is way too early in the year for snow. Yesterday, Brian had to go to my parents' house to work on Becky's car, and he brought Luke with him. I dressed warmly and then walked over there with Joey so we could see Luke. He is SO cute--he gets even cuter every time I see him. Right now, he's always asking, "That?" and pointing at things, wanting to know what they are. And yesterday, he kept saying "Joe? ", wanting to know where Joey was at all times. We went into the backyard to let Joey run down to the lake. He walked around in the water a little, which was comical because he was always holding one paw out of the water and standing on three legs. WHAT? (I have no idea what that blue line means, either). I'm sure that the numbers on the treadmill aren't correct, either. So, I will just have to ignore the pace on my Garmin from here on out when I'm on the treadmill, and simply run based on my heart rate. Whenever my heart rate gets over 144, then I'll drop the speed a little; if it gets lower than about 138, then I'll bump the speed up a notch. In order to see whether I'm making progress, however, I decided to do a baseline run today outside (to get an accurate pace). The whole goal was to run for 30 minutes while keeping my heart rate under 144 bpm. I was fully expecting to have to walk quite a bit to lower my heart rate, but I managed surprisingly well, and didn't have to walk at all. 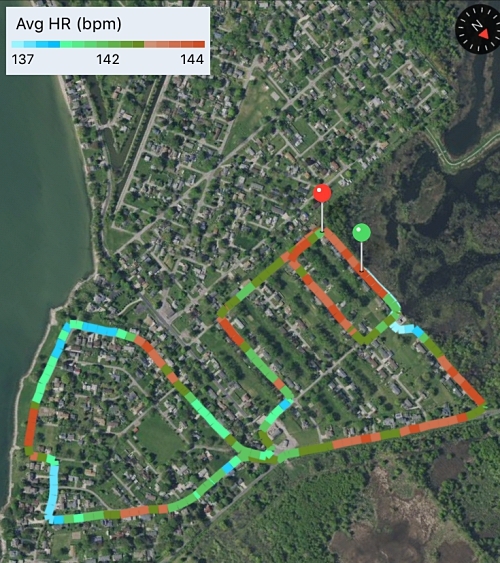 I set the Garmin to beep if my heart rate hit 145, so I would know to slow down (without constantly looking at my watch). It only beeped at me a few times. I was very surprised when I had to pick up the pace in the second mile because my heart rate was dropping. 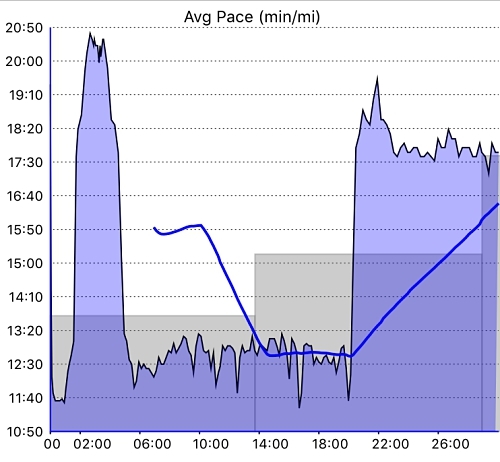 Usually, it's the opposite: the longer I run at a given pace, the higher my heart rate will climb. This is a cool way of looking at my heart rate, too--it shows by color about what range it's in. The blue is where it was low, at around 137 bpm. And the brown is where I got to the high end at 144 bpm. 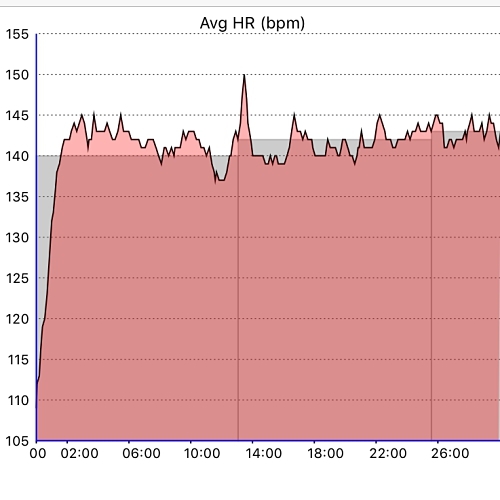 Anyway, I really love heart rate training! I find the runs to actually be enjoyable because it doesn't feel so hard. I'll have to remember to dress extra warm if I run outside, however, because I didn't even break a sweat today. I was freezing the whole time! If I was running hard, I would have been a lot warmer. I've gotten some questions recently about heart rate training, so I will start writing a post all about that. I miss writing about running! Even during my hiatus, I enjoyed talking about and writing about all things running. And even though I don't run like I used to, I'm still a certified running coach with running on my mind a lot of the time. I know you have said before but how did you decide on the HR "window" that you use? I chose to use Dr. Phil Maffetone's formula of 180 minus your age (I'm 36, so mine would be 144). That number is the maximum that he recommends for this type of training. I am going to (hopefully) get a whole informative post about it up this week! Do you have any favorite cold weather running gear (especially pants)? We live in Ohio; so not as cold as your area, but still cold. Yes! 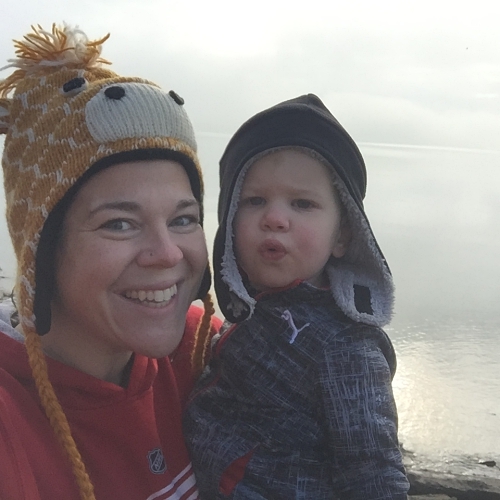 My favorite cold running gear can be found on my Favorite Running Things post: https://www.runsforcookies.com/2017/11/my-favorite-running-stuff.html. Hopefully that helps! I'm interested in heart rate training. How long should you train using your heart rate as a guide? For example, should I train for a half marathon using HR? Or is it better just to set a certain time limit to run using HR training? Thanks for any info you can give me!